“Would you take 650 a head for the entire group?” Greg said. “Whenever. Whenever there are good cattle to be bought,” John said. “Do you think we made the right decision,” Dad said. As our hay supply dwindled and the groundhog didn’t see his shadow, we thought about selling our yearling heifers. We planned to select the heifers we wanted to breed and keep for cows and then offer the rest privately for farmers to add to their cowherd. Whatever was left would be sold at the local livestock auction. We have been doing this ever since we improved our genetics using Red Angus bulls and have always had a positive response from farmers. We ran the ad for three weeks and I received no calls the first week, two calls the second week, and four calls the third week. Nibbles, but no bites. It appeared that our price was a little high. We were asking $700 a head. The feeder calf market was soft in January and the first half of February. Our best estimate was that we would get $500 to $550 a head at the sale barn. One guy stopped in a couple of times and told us we were $100 too high. We thanked him for his interest and told him we would tell him when we took them to the sale barn. Dale stopped in and walked through them. We could tell he was impressed when 978 walked up and licked his arm. People are impressed by quiet cattle. Dale was interested, but in the whole group. He wanted us to call him when we took them to the sale barn. We called Kevin at Bloomington a week in advance of the sale so he could advertise them. We contacted a trucker to help us haul them. Everything was lined up for the March 12th sale. And then John and Greg stopped in and made us a great offer. The very night after we declined Greg’s offer, Kevin called us to make sure we were bringing our heifers. He said they had received calls and there was definitely some interest in them. Dad and I were glad we weren’t going back on our word. We sat and watched cattle sell. There is always tremendous variation in the prices. Four red heifers averaging 666 lbs., brought 95 cents per lb. Five black heifers averaging 632 lbs., brought only 88 cents per lb. 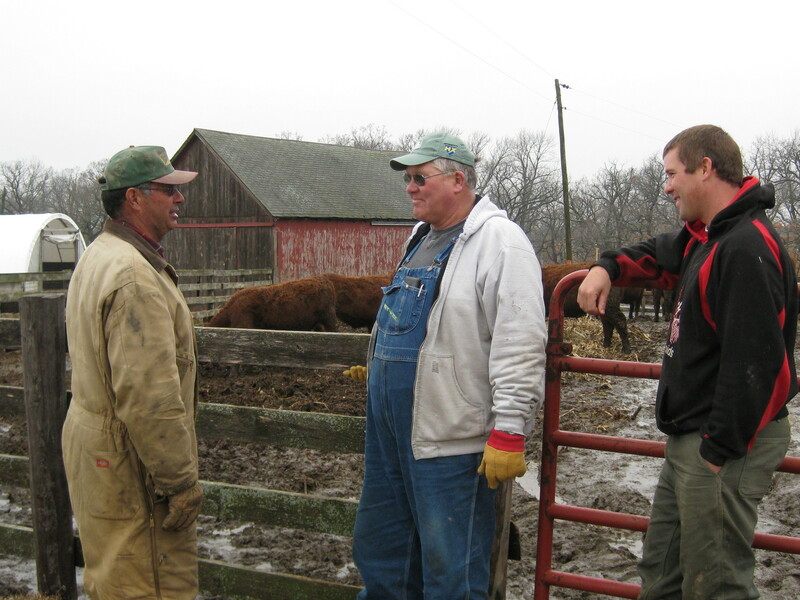 Thirteen red heifers averaging 656 lbs., brought 99.5 cents per lb. I hoped ours would bring that much. Our heifers came in the ring. They looked good. Thirty-eight heifers averaging 666 lbs., brought 102.5 cents per lb. Two small heifers averaging 420 lbs. , brought 112.5 cents per lb. Dale was the winning bidder for all of them. They averaged $672 each. Even after commission and trucking was paid, we still made well over $650 each. We were happy. We made some money. And more importantly, we stuck to our word and kept our reputation intact. This entry was posted on Friday, March 26th, 2010 at 12:49 am and is filed under Curious business, Curious cattle. You can follow any responses to this entry through the RSS 2.0 feed. You can leave a response, or trackback from your own site. Good for you. I think farmers are more honest that most other groups. I’m a self-employed computer programmer and I’m ready to chuck it in. My competitors all under-bid me knowing they can’t do the job for what they’ve said then they keep making up excuses as to why they need extra time. Conversely, one customer – knowing I have a “no cure, no pay” policy – ran me ragged with changing requirements, then told me when we were nearly there that he had “run out of time” and needed to hand the project over to one of his own guys. I checked the code and he had used everything I did, added a tiny bit to complete and got the work for free. His guy didn’t have the knowledge to do the hard bits so they ripped me off instead. Thanks for sharing, Chainey. As a long-time commenter it’s great to know more about you. Sorry you are discouraged by your work. I like your “no cure, no pay” policy, though. You must be good at your work!